Each image of me represents who I am. Clothes off, workout clothes on, dressed up and with or without make-up. A former colleague of mine posted something yesterday that has been on mind as well. I have seen a shift, in my life, when it comes to women supporting women because I surround myself with it. I have joined women's groups, reconnected with women from my past that I love and nourish my heart and soul, I volunteer for women's groups and most of all I do my best daily to help lift women up. The problem is I see a lot of the opposite outside of my life. I am a firm believer, something that is ingrained in my personality, to help those outside of where I live my life. So I hope this gets to as many women as possible and they start taking ownership and accountability from with-in. That is the key to happiness and living a healthy life! Remember health is not how you look it is how you feel emotionally, mentally and spiritually besides physically. When we see a post of a woman showing herself like my middle picture, we should not degrade her or make her feel bad about who she is for doing so. You think by saying “you are beautiful on the inside you don't need to post pics like this to be liked" is helping her but what it is doing is making her feel worse. You may think that the statement or your 2 cents is coming from a good place, but what it is more…. it bothers you. It is something you feel uncomfortable with and therefore you project your opinion onto others. If you don't agree don't comment. And if you see see something that bothers you, stop and ask yourself why. It isn't about the person you see it is about you. It is something you have growing inside you that makes you see what you see. As a NLP Practitioner, I see more and more this difference of thinking. This is due to our MAP, our programming. Our programming throughout our lives has created our beliefs. We are told this is wrong, this is bad and this is right, this is good! So in your head that is law. But it isn't law to someone else. We all do things and post things with our beliefs in mind. Some good, some bad. I firmly believe as we go through life and really want to get rid of our old story and create a new, we can change our beliefs. Nothing from your past has to be in the chapters of your present story or future story. And when you step into your light, the messages you give to world will change. Keep in mind when you are dealing with others around you, we all take in information differently. Think of being in a course or workshop, the instructor will give you a ton of information. You take that information and you distort, delete and generalize to fit your belief system. Your unconscious mind’s way of protecting you, so it thinks. So you may notice if you are put into groups and have to do an exercise that one or two people see something different. Instead of saying they are wrong, listen to their view point and step into that. You may never fully understand but by doing so you open the door to other views and ways of thinking that doesn't make others feel like an outcast. If you are a Health and Fitness Professional keep posting based on a strong vision you have for your clients. Make sure everything is coming from a place of compassion and curiosity not a militant authority. To me that is just throwing your weight around and trying to be a big dog. Trust me, that only goes so far. Our bodies are amazing in every way! In every shape! Our self-judgement is what stops us from doing and being who we truly are. It is why we suppress our greatness. It is why we project our beliefs on others. Guess what? I have my clothes on. They don't know what is under my clothes. To them I’m fit and in good shape. And even if they didn't say that, I'm not going to strip down to my undies to show them either way. We are so hard on ourselves about our looks but never stop and think that others see us differently. We can't even take a compliment anymore without saying something negative. “wow you are in great shape" “oh ya well I use to compete and this is the heaviest I have ever weighed but I am trying to lose weight” They aren’t thinking anything but what they said but because we feel uneasy in our skin we have to explain ourselves so they know we know what we think they mean. Did you get all that? Just SAY THANKS! Take the compliment and feel good about it! The bottom line is they can only determine our character by how we speak to them. How we treat them and others around us. They go by personality and body language. They will characterize us based on whether we are a happy person, sad person or angry person. So whether you post pictures of yourself in workout clothes. in your boy shorts with no make-up or dressed up with make-up, we are the same person. Our core doesn't change. When I work with my clients one of the largest components I focus on is self-worth. I want women to realize no matter what they are good enough. You don't need to do anything for validation, for approval. You don't need to NOT do something because you are afraid of what others think or that they may not like you. We are so hard on ourselves that we end up using PUNISHING strategies to eating and exercise. It also makes us miserable. So in turn that projects out. It can come in anger or sadness. It can come in rebellion or being overly pristine, afraid to do anything. When working with clients as a Holistic Living Coach, I find their biggest obstacle is trying to be perfect. They steer off course and then judge themselves into a pint of ice cream and a bag of Doritos with a side of french fries! There is NO PERFECT JOURNEY! We can't strive for perfection in an imperfect world. One thing I would love for you to try tonight when you go to bed. Lay still, close your eyes. Take a few deep breaths in and get connected to your breath. Now step out of your body. Float above so you can see yourself. Go back and see what you have accomplished, things you have overcome, challenges and tragedies you had to endure. You are here today! You survived ! Now consider this, should you still be so hard on yourself? Life is a hard road to travel. There is no handbook. Sometimes you don’t know if something is the right way or wrong way until it's already done. When you open our eyes, realize you have done the best you can with what you have. Your old story does not define you! BUT you also need to step out of victim mode and become accountable. You are still living your old story because you choose to. Your old story can make you a victim. And you are not a victim! STEP INTO YOUR LIGHT! The old story may seem long and painful but it boils down to one thing. It isn't easy to see sometimes but with some helpful guidance and tips you can discover what that is. I am doing a FREE Masterclass next Thursday December 13th at 6:30 pm. It is called BREAKING BAD…. (habits). Click on the image below to reserve your spot! 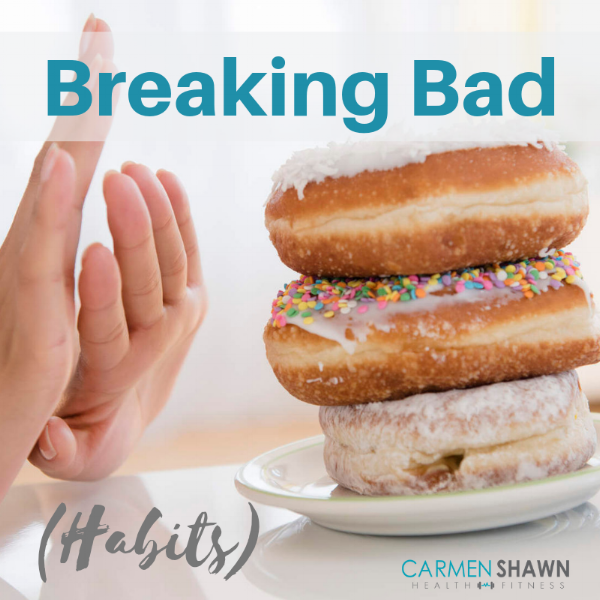 If you feel you are chasing your tail, stuck in your ways and it's projecting onto others, have bad habits that are keeping you stuck or just want to help keep some new healthy habits you started stick, then please join me! I would love to chat to you more about how to shorten your old story, create a new one, and how to make new positive habits stick around!